Martellus Bennett is upset with the NFL over his shoe fines. 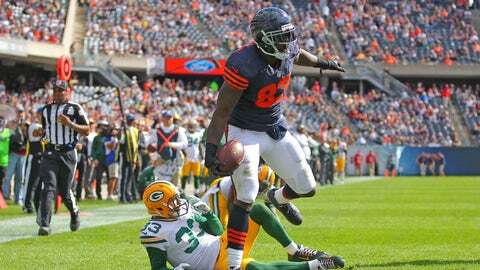 One would have to imagine Martellus Bennett was already unhappy with his Chicago Bears falling to 0-3 after a 26-0 loss to the Seahawks on Sunday. To make matters worse, he was fined $5,787 for his choice of shoes during the game. Bennett has played in all 16 regular season games each year since 2012. However, they haven’t all been pain-free. The veteran tight end has battled foot ailments in recent years, but he has finally found a pair of shoes that help alleviate the pain. The Jordan Brand cleats Bennett prefers are black. The problem is, the Bears designated prior to the season their predominate shoe color would be white. The result is Bennett having to cough up some money which, obviously, isn’t sitting well with him. “I’m just pissed off at the NFL,” Bennett said via the the Chicago Tribune. “They get mad because my cleats are too black, but they’re perfect for my feet. And I feel like they’re supposed to protect the players, and I have a certain shoe that feels the best with my foot. I’ve had foot problems over the last two years. Bennett has a couple of options. He could continue to wear the more comfortable shoe knowing he’ll have to write a check each week, or he could switch to one that’s mostly white but may cause discomfort. Or he could paint the ones he has, I suppose. It sounds as though the decision has already been made. Bennett is opting to avoid further fines (for now) since he will have to eventually pay for his daughter’s college education. An ideal scenario would be for Jordan Brand to come up with a white version of Bennett’s preferred shoe. Given his insistence they help, Nike has to come through for him, right? And maybe he can commiserate with another former Bears receiver who went through the same thing.